Beaune (pronounced ‘bone’) is the wine capital of Burgundy, just south of the regional capital Dijon (of mustard fame, but more on that later). The medieval town retains much of its ancient architecture and is encircled by battlements, ramparts and towers – many of which still stand today. The Grosse Tour – a massive 16th century tower stands to the south of the town, while the Tour Blondeau dating back to 1465 can be found along Beaune’s eastern ramparts. A stroll along the ramparts allows a great view of the small town and the surrounding countryside. The Beffroi (clock tower), and the collegiate church of Notre Dame – a 15th-century church famous for its tapestries, on display inside – are both fine examples of this quaint town’s medieval architecture. Beaune however, is synonymous with wine. 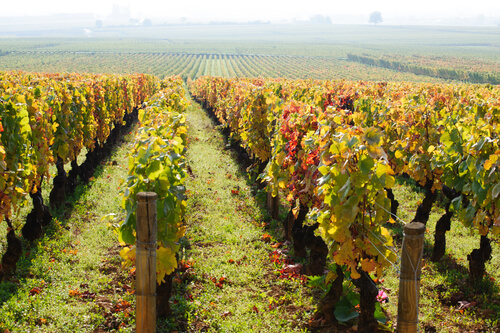 A region blanketed in grapevines, this part of Burgundy has been making wine since the Roman times. It is a fantastic point to visit any one of the dozens of world-class vineyards – Louis Jadot, Bouchard Père et fils and Joseph Drouhin to name but a few – in the surrounding countryside that forms part of the famous Route Des Grand Crus. The jewel in Beaune’s crown is the Hospices de Beaune. One of the largest and best-preserved renaissance buildings in Europe, the Hospices is a fantastic example of the polychrome renaissance roof style done in ‘Burgundian tile’. Red, black and yellow diamond-shaped tiles create a roof that looks like something out of a Disney fairy-tale. Originally built in 1443 as a former hospital for the poor, the Hospices de Beaune (also known as the Hôtel-Dieu) is now a museum. Beneath its ancient floors lie a labyrinth of centuries-old tunnels and cellars that hold some of the world’s most prestigious wines. The Hospices de Beaune wine auction is also the primary wine auction in France. Since 1859 an annual charity wine auction has been held here taking place on the third Sunday in November. The non-profit that owns the Hospices also owns 61 hectares of vineyard land where Cru and Premier Cru wines are produced under the label, Domaine des Hospices de Beaune. It is usually these wines (and others) that are sold at auction often reaching values far higher than the commercial market value. On Saturdays, a fine food market is held in the old town. Here, local suppliers sell Bresse chicken, soft cheeses, local truffles and wines. As always in a wine region, there are fantastic places to sample some of the Produits du terroir (local food of the land) such as Boeuf Bourguignon, escargots, Coq au Vin and even frog’s legs – all classic French dishes with their origins in the Burgundy region. The casual but fine dining establishment Le Bénaton is one of our favourites. There are also plenty of places to stop off for an impromptu wine tasting session. La Cave de l'Ange on the edge of town is a very popular one that often accepts walk-ins. 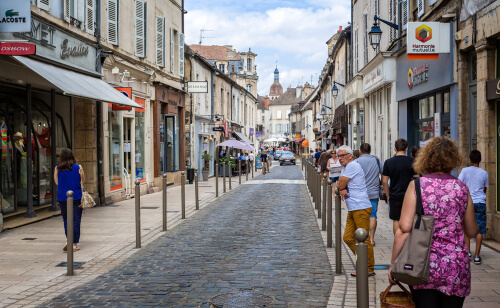 Like its northern neighbour Dijon, Beaune was also a famous mustard producing region and Moutarderie Fallot is one of the region’s last family-run mustard companies. Tours show how the mustard seeds are hand-milled and stone-ground to create its lovely, spicy paste. Make sure to come with your belly empty and enjoy a bacchanalian few days of eating and drinking.